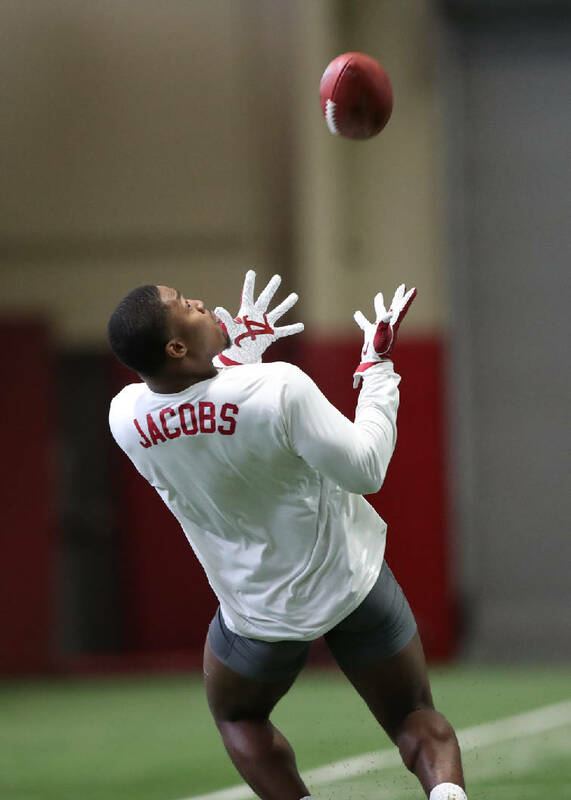 Former Alabama running back Josh Jacobs looks for the ball during Tuesday afternoon's Pro Day in Tuscaloosa. Alabama held its annual Pro Day on Tuesday, with the talent-rich event again luring New England Patriots coach Bill Belichick to Tuscaloosa. Belichick wore an Alabama pullover as he watched the former Crimson Tide standouts go through various drills. "I didn't give it to him," Alabama coach Nick Saban told reporters, "but I'm glad he's got it." There were 19 draft-eligible participants who selected to perform various tasks ranging from the bench press to the 40-yard dash to doing interviews. Also attending were new Cincinnati Bengals coach Zac Taylor and a slew of NFL general managers that included Oakland's Mike Mayock, San Francisco's John Lynch and Tennessee's Jon Robinson. Alabama has produced four first-round picks each of the last two years and on four occasions since 2011. No program has provided four first-round picks in five separate drafts, with Alabama and Miami the only schools to attain the feat four times. The Tide's four first-rounders last April were defensive back Minkah Fitzpatrick (11th to Miami), defensive tackle Da'Ron Payne (13th to Washington), linebacker Rashaan Evans (22nd to Tennessee) and receiver Calvin Ridley (26th to Atlanta). Defensive tackle Quinnen Williams, who won the Outland Trophy last season as a redshirt sophomore and was a unanimous first-team All-American, is expected to be a top-10 pick next month after bypassing his final two seasons of eligibility. ESPN draft analyst Todd McShay rates Williams as the No. 2 overall prospect for the late-April stage in Nashville. "I definitely didn't feel like I was going to be here today," said Williams, who started just one season for the Tide. "It was probably seven months ago – I wasn't even starting or ever thought about it. It's just sinking in. I don't have to perform anymore. I've earned my spot now. It's crazy." Other likely first-round selections are offensive tackle Jonah Williams, who was also a unanimous All-American, and versatile running back Josh Jacobs. Alabama's best chance at a fourth first-round selection would be among tight end Irv Smith, linebacker Mack Wilson, safety Deionte Thompson or even running back Damien Harris, who is a rarity among this year's Tide elite draft hopefuls by having played all four seasons. McShay rates Jonah Williams 14th, Jacobs 18th and Smith 31st overall. Alabama also had a program-record 12 players drafted last year and could challenge that standard this time around with a deep contingent that includes interior offensive linemen Ross Pierschbacher and Lester Cotton, cornerback Saivion Smith, defensive lineman Isaiah Buggs and outside linebacker Christian Miller. "I've heard a lot of good feedback," Miller said. "They see me playing all over the place. Some see me as a defensive end. Some see me as a linebacker. It allows me to leave the doors open for playing multiple positions on different teams because I can fit into any scheme."